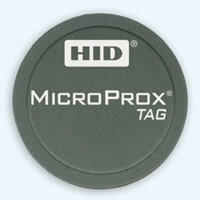 The MicroProx Tag provides the convenience of HID's proximity technology in a small 1.285" (32.64 mm) disk-shaped transponder. Simply attach the adhesive-backed Tag to any nonmetallic card or device, and you instantly have a proximity card! Carry prox on a device you always have with you - like a cell phone or PDA! Seamlessly upgrade from Wiegand, magnetic stripe or barium ferrite technologies by simply adhering the Tag to your existing access card. Easily and cost-effectively turn a plastic ID badge or contact smart chip card into a proximity credential! Add proximity access control capability to users' cell phones, PDAs and other similar nonmetallic devices. Experience the convenience of proximity without the expense of rebadging! MicroProx is custom programmed to each customer's specifications, and no cancellations or returns are allowed. Lead time 3-4 business days. Minimum order 100 tags. Above 100 tags, please order in increments of 50.